Recently the Montego Bay Convention Centre was the proud recipient of the Hospitality Services Partner Award from the Montego Bay Chamber of Commerce Industry . 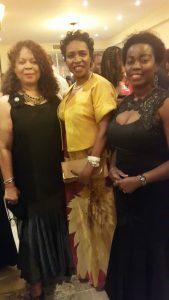 The night brought several patrons to the black tie event at the Hilton Rose Hall Resort and Spa in St James on Saturday November 14, 2015. Guest speaker the most esteemed Congress Woman Yvette Clarke who in April, accompanied President Barrack Obama on his historic visit to the island, told the gathering that the US president, along with herself were committed to building relationship between the United States and Jamaica on issues such as trade, energy security, manufacturing, tourism and economic development. “I have worked to re-establish the Congressional Caribbean Caucus of the 114th Session of Congress,” Clarke said. “The caucus,” she said, “has already provided Members of Congress with the ability to coordinate with CARICOM and individual Caribbean nations, such as Jamaica, to resolve problems such as natural disasters, and to support econ omic development. 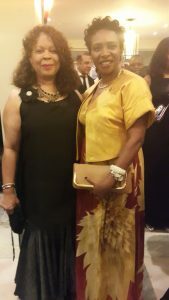 With the Congressional Caribbean Caucus, we will continue to work with federal agencies to protect bilateral relations between the United States and Jamaica,” she said. She expressed the view, however, that investments could increase dramatically, if elected officials and government agencies in the United States develop procedures to allow companies in the Caribbean to access resources at a fair rate of interest, thus allowing investors in the region to earn a fair rate of return. This, she said, would create jobs and expand the economy. “This is one reason why I am particularly dedicated to collaborating with all federal agencies to encourage direct investment from the United States, particularly from the Caribbean American community, to Jamaica and Caricom nations. 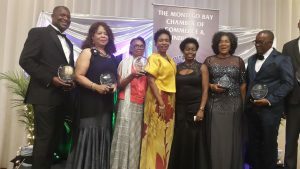 Meanwhile, five outstanding business leaders were inducted into the inaugural Montego Bay Chamber of Commerce and Industry Business Leaders Wall of Fame during the glitzy function. The five industry legends are hotel mogul, Gordon ‘Butch’ Stewart; business exemplar, Anthony ‘Tony’ Hart; tourism transport mogul, Ralph Smith; the late in bond merchant pioneer, B D Dadlani, and real estate developer, ‘Slidie’ Joe Whitter.